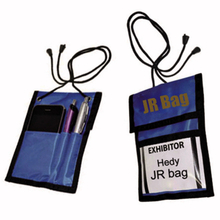 The fabric badge holders is a convenient and practical badge holder of us. The biggest characteristic of fabric badge ID holders is there is a pocket in the back of the ID holders, you can put mobile phone, pen or other common small things in it. So that the fabric badge ID holders is not only badge holders. On the front of fabric badge holders is a transparent plastic, that allows you to see the cardholder information clearly. It is convenient to doorkeeper and organiger. The material of fabric badge holders are polyester and PVC, good materials make our fabric badge holders durable, wearable, high-intensity. It is also easy to clean, and after several cleaning, the fabric badge holders will still retain primary colors. As a professional China ID holders manufacturer, our production principle is to provide high quality and inexpensive products for customers, we guarantee the quality of all the products. Just to choose your needs.